Chalk this one up as a sign of the uniqueness of western Michigan. When I moved to Holland in 1995, I was immediately struck by the unique cultural climate in this area. Where else do you find restaurants with Bible verses painted in Dutch on the walls and Today in the Word devotionals in the tourist racks? This area is very religious, but well educated. A hundred plus years ago some some intelligent, devout Dutch immigrants settled here, and out of this fertile soil grew not just church upon church, but many Christian publishers like Zondervan, Eerdmans, Kregel, and Baker. I’ve enjoyed living in this cultural climate for this very reason, even though as a Norwegian I’ve had to stretch to fit in among my Dutch friends. But this was a new one on me. 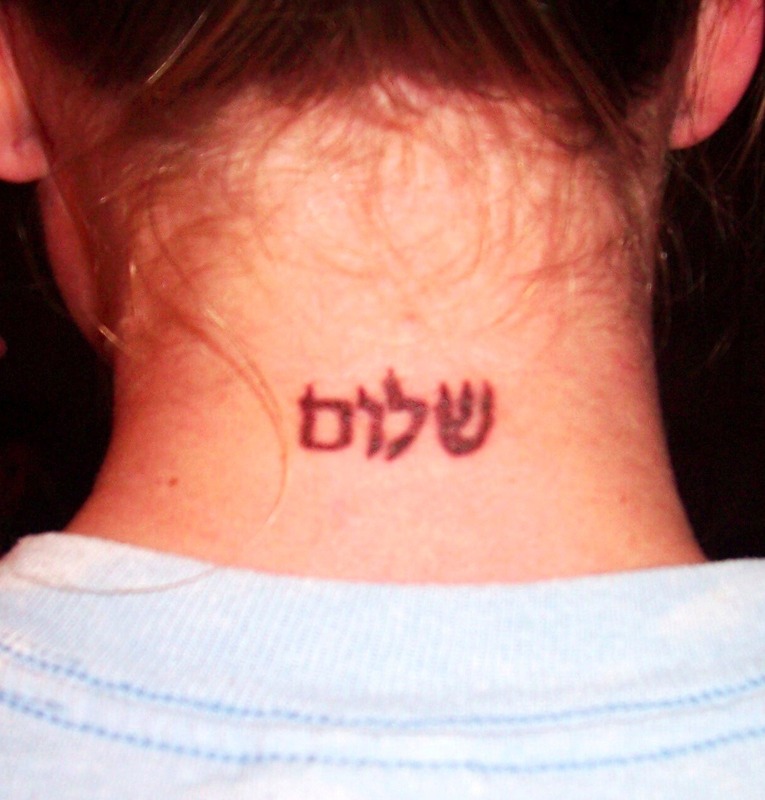 A college-aged neighbor asked me how to spell the word “Hineni” so that he could tattoo it on his shoulder blade! “Hineni” means ‘here I am” or “at your service,” displaying a readiness to be obedient. It’s how Samuel responded when God called to him when he was a boy. My friend is on the Hope College swim team, and the swimmers were all getting a small tattoo (or “tat,” as he called it) that would be only visible to fellow swimmers. He wanted one that expressed his faith, but in a less conventional way. I never realized my years of Hebrew study would serve this need. Then, a few weeks later I was in JP’s coffee shop and the barista pulled up his sleeve to reveal the Hebrew word “Zakhar” tattooed on his forearm! He even paid me the compliment that he had gotten the word out of my book, Listening to the Language of the Bible. Zakhar means “remember.” He explained that he inscribed it on his arm for two reasons — to remember his commitment to Christ, and as a memorial to his older brother who had died a few years earlier. He saw it as kind of a permanent tefillin (phylactery) that would always remind him of what he held dear. It strikes me as amusing and typical of the personality of western Michigan that young Christians here like to combine ancient biblical words with edgy forms of self expression. Both of these guys are quite intelligent, intentional Christians who see their body art as a way to express their commitment. Fascinating. 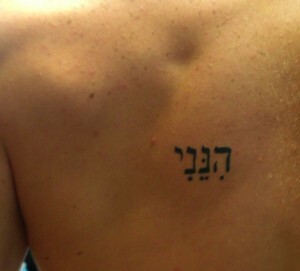 So, if you want a tattoo, Hebrew is totally cool in our area. If you don’t believe me, here’s yet another tattoo that says “Shalom.” This one is on a female swimmer, a friend of Mr. Hineni. I haven’t heard the story behind it yet. My husband just found out about you book and wants to order it! So we will! Sounds wonderful!Recently my husband has been very interested in Hebrew customs and history. We are the teaching pastors at our little fellowship, both of us have Theology degrees. You said you are Norweigan on both sides. My husband is what I call Scandahoovian! LOL! Swedish, Danish and Finnish and his real last name should have been Johnson, they were from MN…long story. My point is, through his mother’s family traced back to Finland and Sweden, he has Jewish roots! One ancestor’s name was Israel Zachariahson…my iterest peaked at this point because of my husband’s great interest with Jewish history. Some say the tribe of Dan spread to Danmark and Swedan! God promised to call his people back to Him. I have talked to many others who seem to have this deep calling to return…whether to Israel the country, or Israel as a people in their hearts! I love what God is doing! Uff-da, what a family. Yah sure you betcha, Karen! Thanks for your comment. 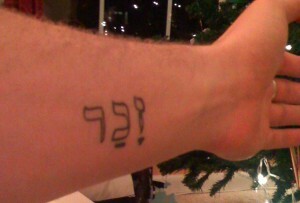 Kurt, from your comment and my reading elsewhere, I think that Hebrew tattoos are pretty widespread. After I wrote this I found this article by John Parsons, which I thought was very good. It sounds like as a Hebrew expert, he gets lots of requests for spelling Hebrew words and he makes a policy not be a tattoo consultant. But I think John has a point about our bodies being in the image of God, and that we should treat the wonderful gift that God gave us with honor and respect. Ha! I just stumbled across your blog, and I couldn’t help but laugh a little – I just got a Hineni tattoo this weekend! I am wondering why the author would make such a pejorative statement as “This area is very religious, but well educated.” Are not religious people supposed to be “well educated” or are “well educated” all non-religious. Not being able to get an advanced education is hardly an insult – many do very well without it. But Harvard and MIT are not very religious places, you have to admit. Considering that I have a PhD and am an evangelical Christian, it amazes me that you’d make this accusation. In regards to the tattoos in Hebrew, the thought occured to me, why not have t-shirts made up with selected Hebrew words in large font and then in english a a small font the meaning of the word. This could be a great fundraising idea for several of your books. And best of all people would not have to get a tattoo to share with the world their faith statement. I thought “zakhar” meant male and “zekhor” (זכור) was the imperative form of the verb to remember (זכר). You’re right, but there’s a reason for the word choice. The form of the verb that I quoted is the second person masculine singular form of the qal stem, in the perfect tense. It’s the standard way that verbs are listed in dictionaries. That’s the way it appeared in my book because the chapter was about the overall sense of the verb “remember.” My friend copied that image for his tattoo. And yes, another identical word, zakhar, means “male” – its an unrelated homonym. I think Hebrew is an amazing language but sometimes it makes my head spin. Thanks for clearing that up for me. I ironically had been wanting to get a tattoo similar to your friend’s and been researching the word/phrase. I also have just begun learning Hebrew so I am not that far along. Anyway, thanks again. I too was surprised to read “very religious, but well educated.” I changed the words (in my mind) to read “very religious AND well educated”. I use ‘but’ rarely.